The purpose of the Patron Fund is to augment the League’s resources with annual contributions, thus avoiding special fund drives. It is no secret that the League’s services cannot be financed solely from membership dues, so in common with the ABA and most state and local bar associations, the Patron Fund reaches out to seek funds beyond League dues to support some of the League’s worthwhile needs. The Patron Fund was created in 1963 by a resolution of the Board of Governors. The Patron Fund Board was formed in 1993. Its five members work to promote Patron membership and to advise the Board of Governors as to how Patron members’ dues and the interest from the Patron Fund should be invested and spent. The CLLA and all of its regions, sections and committees are eligible to receive Patron Grants. The authorized representative of the region, section or committee simply completes a Patron Fund Grant Request Form. The form is available by contacting the CLLA or may be obtained from the Members Only Section of the CLLA website at www.clla.org. The executed form should be submitted to the Patron Fund Board, and if it is approved by the Patron Fund Board, the Grant request is forwarded to the Board of Governors for a final determination. Over the years, the Creditors’ Rights Section, the Commercial Collection Agency Association, the Expansion and Promotion Committee, the Membership Committee, the Bankruptcy Section, the joint Western-Southern Regional Meeting and others have received financial support in the form of grants. 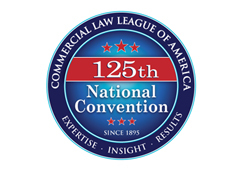 The money has been used for many purposes, including the purchase of a traveling booth for the League, payment of a retainer and expenses of League Counsel, subsidizing the cost of speakers and panelists at League functions and paying for lobbying at both the state and federal levels. All CLLA members are eligible and are invited to become League Patrons. The most important reason to become a League Patron is to support a very worthwhile program. Additionally, League Patrons are honored by being listed in the Patron Roster which is distributed at each League meeting and conference. When attending League functions, the badge of each League Patron includes a special sticker showing fellow attendees that he or she supports the Patron Fund. The need for a strong Patron Fund has never been greater than it is now. So please take this opportunity to pledge your support and help the Fund to continue its forty years of valuable service to the Commercial Law League of America and its constituent groups. The following is a list of firms who have made contributions to the CLLA Patron Fund since May, 2017. Caine & Weiner Co, Inc.
Totz Ellison & Totz, P.C.